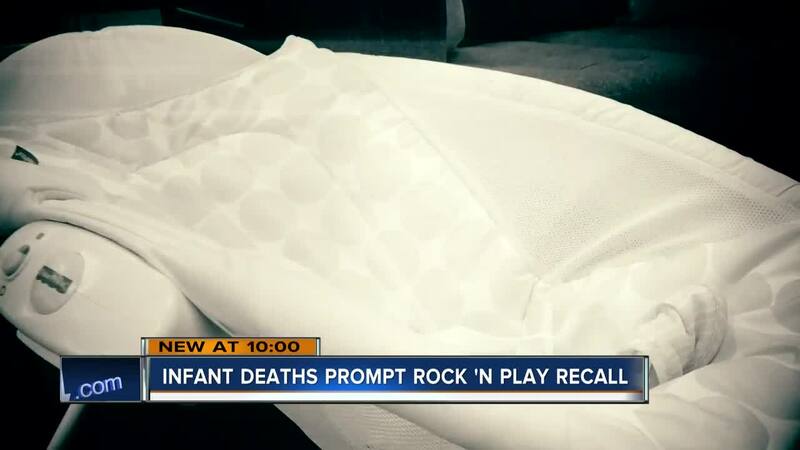 While Fisher Price and the Consumer Product Safety Commission issued a recall on the Rock 'n Play sleeper, parents have mixed reactions. While Fisher Price and the Consumer Product Safety Commission issued a recall on the Rock 'n Play sleeper , parents have mixed reactions. The recall says since 2009, more than 30 babies have died while using the product after they rolled over while unrestrained, or under other circumstances. The news came days after Consumer Reporter published its investigation revealing the sleeper was tied to at least 32 deaths. It also came after the American Academy of Pediatrics urged a recall saying the product did not follow safe sleep guidelines. "In terms of will we use it again? Or is this something that we're just going to throw to the curb now that it's been recalled? I'd really like to have a little bit more information," said Heather Lenox, a mom of five kids in Cedarburg. Like many other parents, the Rock 'n Play was a huge help in her home. She wants the recall to explain the "other circumstances" babies have died under using the sleeper. She also says parents she knows are mixed on what to do. "Half of the people say this is user error that's causing these issues," Lenox said. "And then there's the other half saying 'well the experts say you shouldn't use it then you definitely shouldn't use it.' So there's a little bit of a disconnect within the mom community." If you have had your Rock 'n Play for 6 months or less you can get a full cash refund. Otherwise, you can get a voucher for another Fisher Price product.